Help! I can't stop buying craft supplies! Jewelry-making supplies, to be exact. My plan is to start selling, but that hasn't happened yet (I am making progress though! Many pieces almost ready! I'm excited to post some pictures soon). However... 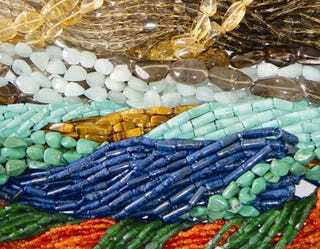 I keep finding supplies (beads, chains) that would be great enhancements to the pieces I'm working on, and I just want to try out all the designs that are in my head! I'm not independently wealthy though, so the budget is tight. Oh Groupthink, what shall I do?